Product Overview The CORSAIR Commander PRO grants superior and accurate hardware control with a compact, all-in-one device. It is fully compatible with CORSAIR LINK devices and supports up to six fan connectors, two internal USB 2.0 headers, four temperature inputs, and two RGB LED channels. Accurately monitor how your system reacts when you push it to its limits. Manage your fans without pressing knobs or switches through the intuitive CORSAIR LINK software. Synchronize your RGB lighting effects with the HD RGB fans, SP RGB fans and individually addressable RGB LED strips to light up your build. The CORSAIR Commander PRO is an all-in-one device that provides control and monitoring for up to 6 case fans, 4 temperature inputs, 8 individually addressable RGB LED strips, 12 HD RGB or SP RGB fans (sold separately), and 4 USB components. Manage and control all of these devices through the intuitive CORSAIR Link software. • Six 4-pin Fan Ports with Voltage and PWM Control: Control 3-pin and 4-pin fans manually or automatically easily and effectively through the intuitive CORSAIR Link software. • Dual Channel Lighting: Add an assortment of RGB lighting with individually addressable RGB LED strips (sold separately) and unleash the full RGB potential of the HD RGB/SP RGB fans (sold separately). Supports 4x RGB Strips per Channel. • Two USB 2.0 Internal Headers: Connect up to two additional USB 2.0 devices while only occupying one USB 2.0 header on your motherboard. • Four Thermistor Inputs: Monitor temperature in different locations throughout your system. • CORSAIR Link Software Support: Manage and control the devices connected to the Commander PRO through our intuitive CORSAIR Link software. • Low Profile Design: Slim form factor means it can be installed anywhere in your case. • 2x RGB LED hub cables. • 4x Fan extension cables. Corsair Commander PRO, Digital Fan and RGB Lighting Controller, Support For upto 6x Fans, 4x Temp. Sensor, 8x RGB Strips is rated 4.2 out of 5 by 9. Rated 3 out of 5 by silverhazey from Warning - may only be 50% functional on your system! Bought this product to connect my Corsair H150i Pro cooler and 9 Corsair fans (4 of which are RGB) to it, only to discover that the USB hub in the Commander Pro doesn't work with every motherboard!! I've an ROG Maximus XI Hero board and when I connect the CoPro to my internal usb header, anything that is then connected to the CoPro's usb hub will not be seen by the system or iCue. As I've ony 2 internal usb headers, this means that one is used for the front panel usb connectors, and the other for CoPro. My H150i Pro cpu cooler now has to be connected to an external usb port on the backpanel of the pc! CoPro works well with controlling all my fans, but unfortunately the usb hub is a fail. This is a well known problem that Corsair is fully aware of!! Corsair should at least inform customers before they buy this product that it may not have complete functionality with their system! Rated 5 out of 5 by Thelyingcake from Great product with some minor hiccups I bought this alongside a bunch of Corsair LL120 fans and it works great however it does certainly have the occasional hiccup software side with the ICUE program. If you want to sync up all your Corsair LED's I would really recommend this however the software does take some getting used to and it will have some minor (though easy to fix) hiccups here and there. Rated 5 out of 5 by Cram808 from Works like a charm The usual Corsair high build quality. The packaging is designed for 'unboxing'. All the cables you need. I also bought two Corsair LL120 RGB Fans to be controlled by commander pro. The RGB cable of these fans won't connect directly, you will need connect the fans to an RGB hub, then connect the hub to the commander pro; I used a Corsair RGB Fan LED Hub. Rated 5 out of 5 by Harold from Should of bought one before Although it is fairly expensive for a fan controller, what you can do with it is well worth it. I have linked up 3 HD120, 3 HD140 RGB fans and the Corsair Lighting Node Pro all to the Corsair Commander Pro and by using the free Corsair Link software you can control each individual fan speed and RGB on each fan. Should of bought one before. Rated 5 out of 5 by aich69 from Great buy if you want to go the RGB route. I've been using the Commander Pro for around 12 months now [I think] and am happy too say that it's one bit of kit on the more gimmicky side of PC components that does what it's supposed to and continues to perform with regular firmware updates. 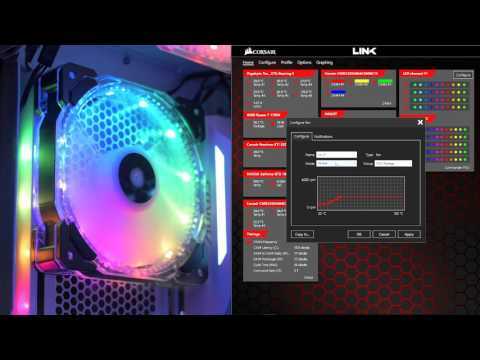 I use it, in conjunction with the RGB fan hub, to control the speed of all six of my LL120 RGB fans. I was concerned that I would lose some control over cooling if I wasn't running my fans from the motherboard but that's not the case; in fact it's now easier to keep temps stable with the Commander Pro and the iCUE software. My motherboard now only controls the speed of my PWM pump. Solid construction and good port layout helps integrate the low-profile unit in to your case and you only need on e SATA power and 1 USB2.0 header on your board for control. In my opinion, if you want to add RGB lighting to your case this is the way to go as the one unit allows you to fully control your fans speed and lighting [with the RGB fan hub] as well as RGB lighting strips. You can also add up to 4 temp sensors; I use one of the temp ports connected to a third party inline sensor to keep an eye on coolant temperature. Rated 5 out of 5 by Robbiati from Wish I'd bought one ages ago... I've used many fan control strategies in the past, ranging from splitters reducing voltage, to motherboard provider software, all of it promising to give that longed-for balance between cooling and fan volume. None of it has worked. This controller has delivered far beyond my expectations, allowing me to fine tune my fan profiles to a degree where I can keep everything turned right down to the lowest rpm, whilst still getting the best performance out of my watercooling set up. Ignore the negative review regarding 3 pin fans - it's not designed for them (though will work with them albeit with less control available). This is a great product and one I wish I had bought sooner. Does this come with the Corsair RGB Lighting controller? The name says Commander pro and RGB Lightning controller, does it come with the controller or not? The RGB controller is built-in; there are two RGB connectors (channels). However, if you need to control RGB fans through the commander pro, you will need to connect the RGB cable of your fans to an RGB fan hub, then connect the hub to the command pro. In one of my builds I needed to connect Corsair LL120 RGB Fans to the commander pro, to do this I used a Corsair RGB Fan LED Hub, plugged the fans into the hub, then plugged the hub into the commander pro. Then I used Corsair iCue to control the fan's lighting through the commander pro. Also, just incase you are wondering, the iCue software recognised each LL120 fan on the hub, so you can configure the lighting on each fan independently of the others. I bought my Corsair RGB Fan LED Hub direct from Corsair; cost &pound;15 including shipping; would've bought from Scan but they didn't have it in stock when I needed.